In you used Windows 7, 8 or 10 to partition your hard drive, your partitions are likely to be already aligned. But this article will be useful for you if you edited partitions in Windows XP or cloned partitions using various third-party software. Here is how to check the alignment of HDD or SSD and align a partition using free utility without formatting and risk of data loss. We recommend to use AOMEI Partition Assistant Standard for aligning partitions. 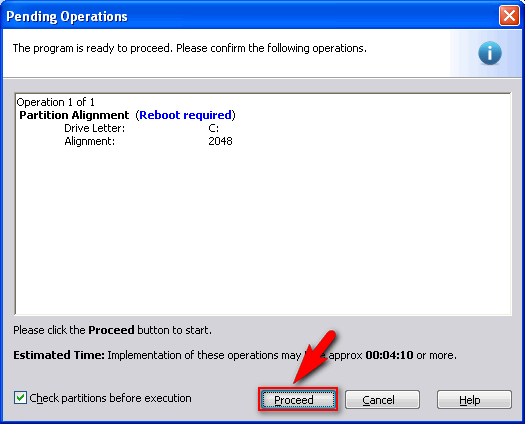 This program is able to align a partition without formatting it and all your information will not be deleted. But it should be said that alignment can take a long time depending on the size of the partition and used disk space. Select the partition you are interested in (left click on it). Click Proceed to start the alignment: Your data won’t be lost! Your computer will restart when done and you will be able to work again.